It is important to understand normal spinal alignment. The thoracic spine viewed from the front to back (coronal plane) should be straight. The shoulders should be symmetrical, the hips level and the head squarely centered in the midline of the body. If a curvature in the spine is introduced in the front to back plane, it will throw off this balance unless an equal and opposite curve develops somewhere else in the spine. Thankfully, this secondary curve develops quite frequently. A curvature in the spine (curve in the front to back plane known as coronal plane) of greater than 10 degrees is called a scoliosis. If the curve is less than 10 degrees, it is not considered scoliosis. This curve can be idiopathic (an unknown cause commonly seen in adolescents), a degenerative spine condition (caused by typical disc disease but with asymmetric wear instead of common symmetric wear), antalgic (caused by pain and not structural) or congenital (abnormal formation of the spine from birth). Deformities of the spine such as scoliosis may or may not need to be treated depending upon the grade of the curve and the symptoms that are generated by the curve. Pain with scoliosis can occur with those who have the condition. The problem with scoliosis is that curves can advance over time and wear can occur from asymmetric loading. Gravity is of course always pushing down on us. Gravity therefore pushes down on the spine. If there is an abnormal curve, the weight of the body above this curve will try and enlarge it. This is somewhat like a bowling ball balanced on top of a spring attached to the ground. If it is perfectly balanced, the ball will stay right on top of the spring. If you push the bowling ball off of midline, gravity will tend to push if further off midline. In fact, the further the bowling ball is from midline, the greater gravity’s push is to carry it further away. Asymmetric wear is the other problem associated with scoliosis. The wear of the spine is analogous to car tire alignment. If the tire on a car is well aligned, you could expect to get 40,000 miles of wear from it. If the tire is misaligned, wear will be uneven and the tire may wear out after 5,000 miles. With scoliosis, uneven wear can cause premature degenerative disc disease and facet arthritis. Eventually, bone spur formation can cause nerve or even spinal cord compression. Normally, scoliosis of the spine is asymptomatic (meaning the curve should generate no symptoms). The reason for treatment especially in adolescents with a growing spine is that the curve can advance (remember the bowling ball on the spring?). Over many years, we have been able to understand that curves over a certain magnitude at a certain age will continue to advance. This is why scoliosis screening is performed in schools. When the spine becomes degenerative in the face of scoliosis because of asymmetric wear, pain will occur depending upon the structures involved. Back pain or neck pain occurs from degenerative disc and facet disease, leg pain from nerve compression and fatigue from an unbalanced curve that requires chronic muscle contraction to stand upright. (Click to Enlarge Image) This is a patient with scoliosis. You can see from this view how the patient’s torso is shifted and the folds of skin in her back are not symmetrical. 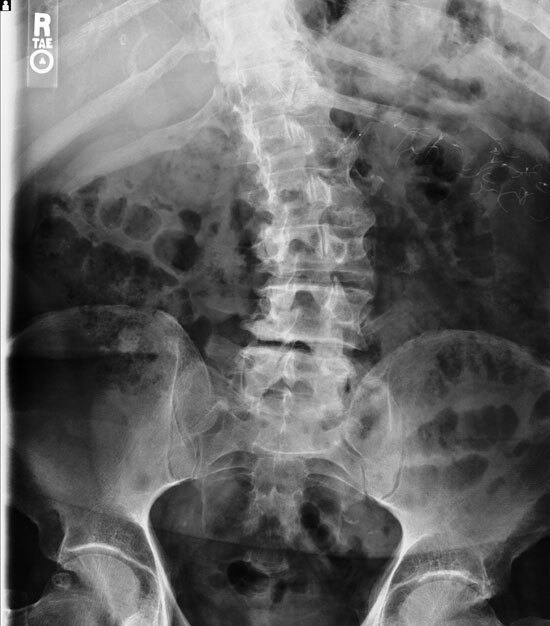 (Click to Enlarge Image) This is an AP X-ray (scoliogram) of a patient with severe scoliosis. The white line depicts the center of gravity line from the head. It should intersect the center of the pelvis. The black horizontal line demonstrates how far off the patients balance is. The amount of energy expended necessary to walk made her use a walker for balance. Are you suffering from symptoms of scoliosis? Treatment and surgery for scoliosis depends upon the age and the degree of curvature in the spine present. Most curves are discovered by a school screening or parents who notice unevenness of the torso of the child. This article is not designed to cover every curve degree and age but general rules do apply. Bracing is used to prevent progression of the curve-not to cause correction. A child with a curved spine under 20 degrees needs to be watched closely. A child placed in a brace with a 25 degree curved spine should come out of the brace at skeletal maturity with a 25 degree curve. A curve over 40-45 degrees normally would have to be fixed surgically in an immature patient. For scoliosis of the spine with degenerative changes, normally found in an older population, treatment is based upon the presenting disorder. If foraminal stenosis develops, the treatment centers on that diagnosis. If degenerative spondylolysthesis develops, treatment is focused to relieve those set of symptoms. Surgery for scoliosis is normally used for progressive scoliosis in the adolescent with curves over 40 degrees. In the older population, surgery for scoliosis to deal with the curved spine is addressed if the curve increases over time or creates pain that cannot be controlled with conservative spine treatment. There are other deformities of the spine that case a curvature in the spine. This video: “Hump-back, Increased Thoracic Kyphosis, Scheuermanns and Degenerative Kyphosis” demonstrates the importance of normal balance and how the normal curves of the spine (cervical and lumbar lordosis and thoracic kyphosis) balance each other out. For additional information on scoliosis, or to discuss scoliosis treatment with a back specialist and spine surgeon in the Vail, Aspen, Denver and Grand Junction, Colorado area, please contact Dr. Donald Corenman.